Most trees are planted in residential yards where the soil is often tired, or experiencing nutrient lock up. For the average homeowner, they know they have hard soil, often referring to it as “clay”. What they often don’t realize is that there is generally no biology left, meaning: no beneficial bugs, earthworms, oxygen, or water to help flocculate that soil. In this condition, soil becomes compacted and almost impossible for anything to grow or flourish. If you’ve ever dug a hole in your yard you know what I’m talking about. The soil is so compacted that you almost need a pickax and a stick of dynamite to dig a hole. For the health of trees, what we like to do is use an electric or gas driven auger to bore holes in a circle around each tree along the dripline, about 3 feet apart making 2-3 rings. In those bored holes we pour in Dry Crumbles®, which has natural biology, growth hormones, and a nice NPK of 6-10-1. What we hope to accomplish is to give the tree a fighting chance at getting the nutrients and minerals it so desperately needs to thrive. Trees, like humans, need nutrition, minerals, water, and oxygen to live healthy and productive lives. The added value of this fertilization method is that you’ve opened up the soil 2-3 feet, allowing water and oxygen to flow to the sub-soil level, while delivering food to the root system of the tree. Shade trees are also often deficient in iron, which can make trees yellow or appear chlorotic. Fertilizing with Dry Crumbles from BioFlora can also help to reverse this effect. BioFlora Dry Crumbles® 6-10-1 + 10% Ca is an organic, dry granular fertilizer that is easy to broadcast and well-suited for broad-area coverage. BioFlora formulated this product to provide an excellent source of high quality nutrients for all types of plants, trees, and lawns. With this idea in mind, Dry Crumbles was developed to be a balanced blend of not just nitrogen, phosphorus, and potassium, but to also contain high levels of calcium and other minor and trace minerals. What sets Dry Crumbles apart is its organic ingredients, reinforced with humic acid and seaweed, creating a unique product that provides all the benefits home gardeners are looking for. 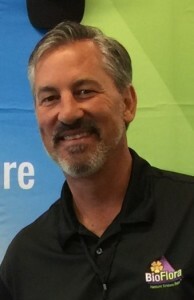 Mark Lundahl is a VP/GM in a Landscape and Design Building firm, is part owner of two garden centers, and a production nursery. Mark has extensive experience with the application methods and rates in using BioFlora products, and has been using the BioFlora product line in his own business for the past 3 years. With these products, Mark has seen dramatic changes in nursery stock quality, and would like for gardeners at all levels to experience the BioFlora difference.